Features: bibliography, sources, general index, index of stories by state. Third in The Ghosts of the Past series. Chris Woodyard, author of the popular Haunted Ohio and Ghosts of the Past series, presents a new collection of all-American Victorian and Edwardian ghosts, evil entities, Fortean mysteries, and the paranormal panics and obsessions of long ago. There are apparitions of fiery devils, giant ghosts with clubs, Men and Women in Black, death omens, uncanny objects, ghostly murder victims, and ghastly phantom faces peering in windows, all resurrected from original 19th-century sources. The Wild Man of Stamford—madman or myth? And many more long-lost tales of ghosts, hauntings, and mysteries from across America. Kestrel Publications is terrified to announce publication of The Ghost Wore Black: Ghastly Tales from the Past, a new all-American collection from Ohio ghostwriter Chris Woodyard. “These stories were written by the Dead,” says Chris Woodyard, author of the 7-volume Haunted Ohio series and the Ghosts of the Past series. “Many of these accounts haven’t seen the light of day since they were first published over a hundred years ago. Drawing on newspaper archives, antique books and journals, and county histories, Woodyard has unearthed a treasure trove of all-new tales that should find favor with fans of ghost stories, folklore, and history, and steampunk aficionados alike. “Although I’ve done some editing and added notes, these are presented as the original newspapers printed them, often with a striking lack of political correctness,” says Woodyard. “Some of the reporting is quite heartless and gory. The book contains over 130 true stories of ghosts, monsters, hoodoos, evil entities, road ghosts, omens of death, and Fortean mysteries from 32 of the 50 U.S. states. Future volumes in the series will include stories from additional states. The Ghost Wore Black is the third in Woodyard’s Ghosts of the Past series. An upcoming book, entitled When the Banshee Howls, will include historic accounts of ghosts, monsters, and oddities from around the world. 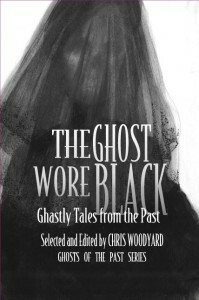 The Ghost Wore Black: Ghastly Tales from the Past, Chris Woodyard, 2013, 6 x9,” 256 pp., $16.95.